MOORPARK, CA, November 16, 2017 -- TestEquity LLC, a one-stop, value-added provider of premium electronic test equipment and eMRO tools & supplies, today announced its new JENSEN Army General Mechanic’s Tool Kit (GMTK). The JENSEN General Mechanics Tool Kit is a modernized portable tool kit designed for use by any repair professional that requires basic automotive-type hand tools. The JENSEN GMTK contains over 200 hand tools—designed and manufactured in the USA—for the in-field maintenance needs of today’s military as well as for manufacturing and field service professionals. 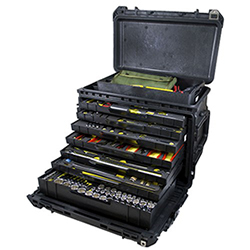 The kit is housed in a heavy-duty tool chest with an insulated double wall design. With a high-density foam-over-foam tool control construction that is thermally bonded and router cut for superior fit, form and function, the JENSEN GMTK is ideal for electronics manufacturing, test and repair, and field services professionals. Quality is optimized with JENSEN’s uniform layout, higher level of tool organization, and dual contrasting foam layers so contents remain secure during mission-critical operations. For more than 60 years JENSEN’s kitting expertise and range of premium offerings has led the industry. "Whether for manufacturing, field service or aviation, JENSEN has always been committed to providing tool kits with high-quality hand tools competitively priced and backed by a no-questions-asked lifetime warranty," said Scott Maclin, Vice President of Product Management and Services at TestEquity. "We‘re proud to employ a dedicated team of professionals who focus on designing and building custom kits to best meet the needs of our customers and we’ll continue to invest in our tool kit solutions." To learn more about Jensen Tools GTS-14250-A U.S. Army GMTK, please visit JENSEN’s web site at https://www.jensentools.com/jensen-tools-gts-14250-a-u-s-army-gmtk/p/gts-14250-a. For more Information about JENSEN tool kits and custom kitting solutions contact JENSEN Tools + Supply directly at news@jensentools.com or by calling 800-225-5370. TestEquity is a leading value-added provider of test and measurement solutions, eMRO tools and supplies. TestEquity also designs and manufactures its own line of environmental test chambers at its headquarters in Moorpark, California. As a customer-centric business with highly trained and experienced product specialists across the United States, Canada, and Mexico, TestEquity helps businesses by providing the industry's top brands together with innovative products and unparalleled customer service.